The November election is still about four months away, yet most Americans are already worn out by the amount of news coverage of the 2016 presidential campaign. A new Pew Research Center survey conducted June 7-July 5 finds that about six-in-ten Americans (59%) feel exhausted by the amount of election coverage, while 39% say they like getting a lot of coverage about the election. This feeling of fatigue is particularly true among those who aren’t following news about the election very closely – 69% of this group say they are worn out compared with about 41% of those who follow the election very closely. That said, just because Americans are worn out by the amount of coverage does not imply that interest in or attention to the election itself is low. In fact, a recent Pew Research Center report showed that there was greater interest than during previous campaigns. Further, in February, we found that 91% of Americans had learned about the election from at least one type of source in the previous week. With so many saying they are worn out by the coverage, what is it that Americans think has been getting too much attention? 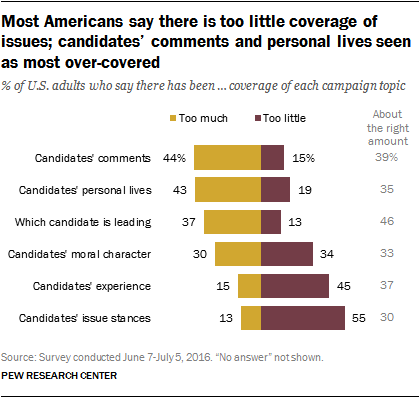 When asked about various topics of campaign coverage, two areas stand out for being over-covered: About four-in-ten say there is too much coverage of candidates’ comments on the campaign trail (44%) and of their personal lives (43%), higher than any other topics asked about. This is followed by coverage of which candidate is leading in the polls (37%) and the candidates’ moral character (30%). Very few say the candidates’ experience (15%) or their stances on issues (13%) have received too much attention. There is only one topic that most Americans say has received too little coverage – candidates’ stances on issues (55% feel this is under-covered). A separate Pew Research Center study from June found that 65% of registered voters said the campaign was not focused on important policy debates, a view held by majorities in both parties. Generally, those who say they are worn out are more likely to say there is too much coverage of every topic compared with those who like seeing a lot of coverage of the election. On one topic a notable party difference emerges in whether there is too much or too little coverage: experience. Roughly half (53%) of Democrats and Democratic-leaning independents say that there has been too little coverage of the candidates’ experience, compared with only about a third (36%) of Republicans and Republican leaners. No other topic differed by more than 6% in whether each is covered too much or too little. The demographic groups most likely to express exhaustion over the amount of campaign coverage are younger adults, women, whites and independents. Perhaps most notably, about two-thirds of 18- to 29-year-olds (67%) say they are worn out, higher than all other age groups (60% of those ages 30-49, 56% of those 50-64, and 54% of those 65+). Whites are more likely than nonwhites to say they are worn out by the amount of coverage (62% vs. 54%), while women (62%) are somewhat more likely than men (56%). Independents (65%) are more likely than both Republicans and Democrats to say this (54% and 55%, respectively).